When I first heard that Man of Steel, the Superman reboot was going to be directed by Zack Snyder, I was not ecstatic to say in the least. I had been burdened with the unpleasures of sitting through 300 (which I own) and Sucker Punch (which was not what it was advertised). Both films had were problematic, 300 race-wise, and Sucker Punch, gender-wise. Sucker Punch was a let down because it had ads showing it was gonna have strong women protagonists and characters, and what it ended up was the exact opposite, but I digress. Inspite of all of the fanboy nervousness about this film, from “Jenny Olson” to the “black Perry White” to the rebooting of Zod, who was well play by Terence Stamp in the 1980’s, Man Of Steel lived up to the hype, and even exceeded it in my limited, humble opinion. The Portrait of Krypton: it was magnificent, awe-inspiring, if you liked the theatrics of 300, you will like Krypton in Man Of Steel, because 300 was all I could think about in looking at this planet. The Portrait of Smallville: I really can’t complain here. It had a Mid-West feel. I thought we were in Kansas, Dorothy. Metropolis: We get to see very little of it, but the parts we do get see, it was just a comprable to the Gotham City from the Dark Knight Trilogy. On the Nature of Religion In This Film: Now, there has been a lot of bruhaha about how Christian and Jesus-y this film is, and there were even “critics” from conservative websites (no I won’t provide links to trash) that if you didn’t like this movie, you don’t like Jesus. Besides the failure of this comparison, there are really two scenes where the film is EXPLICITLY religious; God is only mentioned once. The Superman Is Jesus theme loomed large in Superman Returns, and Bryan Singer really shoved religion in our faces. 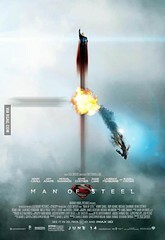 Not so with Man Of Steel, you would have to do a lot of stretching for that interpretation. If you are committed to an uncritical loyalty to the nation-state, and the nation-state’s civil religion, of course Superman/Clark Kent equals an American Gentile Jesus story that white Christians can relate to. Some conservative pundits have even suggested that the villains represent the Soviet Union and communism. What is this, the 1980’s? I would suggest that a different approach is needed, a closer watching of Man Of Steel has a far more progressive message, which I will get into for my next three posts of this series. What I Did Not Like In General: The Editting, specifically the fight scenes made absolutely no sense, but it’s unfair because I compare all choreography to the CW‘s Arrow (also I will be posting on too), since Arrow has such great fight scenes. That’s all I am allowed to say without any spoilers being dropped. So, overall, I loved Man Of Steel; I hope you go see it. I would highly recommend! This entry was posted in Political Jesus and tagged Action Comics, comic movies, DC Comics, man of steel, movies, music, & television, superman on June 18, 2013 by Rod T.
As much as I love DC Comics, there is probably one character I have learned I have a problem with. Superman/Clark Kent. This is coming from a guy (me) growing up, (without any knowledge of what a good movie was) who liked the Superman movies starring Christopher Reeve, whose family watched Superman: The New Adventures of Lois And Clark every Sunday in the 90s, watched the ugly little brother of Batman: The Animated Series— Superman: The Animated Series, had an on-again, off-again, on-again relationship with the CW’s Smallville, and somehow, I just have lost my taste for him for now. I think the problem lies in the underlying science fiction trope behind the Superman mythology. In the old days of science fiction, when there was actually good writing and theory behind it 😉 , one myth set forth was the Enlightenment story of human progress, that humanity would progress through the sciences, for example. Ignored in this narrative is the story of struggles and conflict, as well as a critical take on technological advancements. In short, I think Superman has too cheery of a view of the future, almost utopian in its ideals embodied in the stories of the Legion Of Superheroes. It seems to me, ever since the greatness of Batman Begins, every comic book hero who has had a movie the past decade gets the “Batman Begins” treatment: The X-Men, Spiderman, and with the failure of Superman Returns and both Fantastic Four movies, the reboots will probably be the same. I could care less about the latter, but Superman’s reboot/Batman Begins treatment is the Man Of Steel, an introduction of sorts into the Justice League movie universe for 2015. I don’t know how I am supposed to take MOS seriously with Zak Snyder, director of SuckerPunch as well as the watered-down movie version of The Watchmen, oh, and that whole problematic orientalist 300 movie. I am not as excited about MOS as I am Iron Man 3 for some reason; I admit it, I’m a sadist, and I want Tony Stark to be brought down to earth. From the teaser trailer and the movie trailer, Man Of Steel reads like a Christopher Nolan production (The Dark Knight/Inception/The Prestige). I’m rather surprised Michael Caine wasn’t cast in a starring role. The teaser has the message of progress I have that small disagreement with. At the same time, it feels sorta Batman-Begins gloomly, instead of climbing the cold mountains in a Pacific Asian country as Bruce Wayne does, it seems like Clark Kent is off shore somewhere fishing, depressed white males seeking their life’s mission through moments of solitude. I always saw Spider-man of Marvel, and Batman of DC as the tortured souls for those who love realism in the comic book world, while Superman was more of a source for escapism and science fiction loving types. The latest trailer gave me much more to hope for this film, particularly the last 50 seconds which feature the antagonists (Zod and friends), Lois Lane, as well as confrontations with the military. It’s just going to be difficult for me to see Supes as a suffering servant/scapegoat character, maybe Nolan/Snyder’s interpretation can change my mind? This entry was posted in Political Jesus and tagged awesomeness that is Christopher Nolan, Christopher Nolan, comic movies, DC Comics, man of steel, movies, music, & television, science fiction, superman, television on December 14, 2012 by Rod T.
I guess no more 80’s hair band music, or excessive flag-waving? I am pretty excited about Iron Man 3. I liked the first 2 Iron Man Movies, but yeah the nationalism and arrogance of Stark, and how the movie version of Iron Man became a darling of the political right, just not helpful these days. Fortunately, Marvel has promised to bring Stark down a notch. Here’s to hope! This entry was posted in Political Jesus and tagged comic movies, Iron Man 3, Marvel Comics, movies, music, & television, nationalism on October 23, 2012 by Rod T.